Elizabeth Sanderson's son Tommy has gone missing. He was supposed to be spending the night with his friends Josh and Luis, tromping around their private Minecraft server, but a midnight trip into neighboring Borderland State Park has swallowed him up. Josh and Luis's lips are sealed, and it's only over the course of a few hundred twisty, ominous pages that the full truth of their night at Devil's Rock comes out. At first, I thought I wasn't crazy about this book, but then I remembered what I was comparing it to. Tremblay's A Head Full of Ghosts did such a thorough job of blowing my socks off back in February that anything would have had its work cut out for it as a follow-up. Part of the problem is that I went in expecting more of the same genre, but this books reads much more like a mystery or thriller than a straight-up scare-fest. In A Head Full of Ghosts, there was horror lurking in every room of the Barrett home. 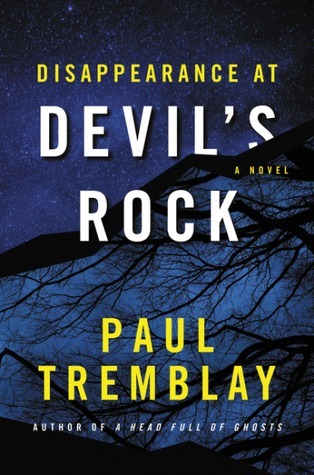 Tremblay takes that tasty melodrama down a notch in Disappearance at Devil's Rock, focusing more on the possibly even more horrific reality of a child, a sibling, a friend disappearing in the deep, dark woods. I loved that Tremblay played around with perspective, taking us inside most of the characters' heads, and I particularly enjoyed it when he switched up the format. Parts of the story are told through handwritten excerpts from Tommy's diary (including a particularly creepy drawing that had me spooked for an entire evening), transcripts of police interviews with Tommy's friends, and present-tense flashbacks of previous visits to the landmark where it all began. Really, I think my only legitimate problem with the book was the abundance of Minecraft references. Then again, it's a contemporary story revolving around pre-teen boys. How authentic would it have been otherwise? At first the protags of DISAPPEARANCE AT DEVIL'S ROCK annoyed me, but then I realized they're middle schoolers. Of course they're annoying. Disappearance at Devil's Rock has aged well in my memory, and I think any fan of the creepier side of the mystery and thriller genres would enjoy it. Either save A Head Full of Ghosts for later, or know that you're going in for a much different ride. I received Disappearance at Devil's Rock from William Morrow/HarperCollins for review consideration. It's Monday, June 20! What Are You Reading?